Dollhouse Decorating! 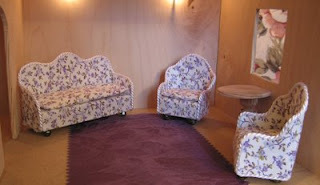 : Make your own dollhouse couch / sofa! Make your own dollhouse couch / sofa! Following the same steps as the post on how to make your own no-sew dollhouse chair, you can easily make a couch or sofa. (For a sofa the block of wood should be approximately .75" x 1.75" x 4.5") Note that this furniture set I made uses smaller decorative rope, and I also added cushions... if you can sew, it would be easier to make your own small cushions that way, but I experimented with fabric glue, and it worked well.